“The only thing stopping the United States from erasing any hint of democracy… is the barrier put up by Venezuela,” Vice-President Garcia Linera said. 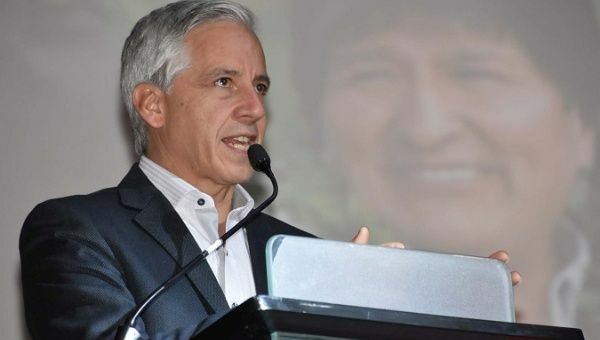 May 19 (teleSUR) In a video message leading up to the Venezuela elections this Sunday, Bolivia’s Vice-President Alvaro Garcia Linera says that Venezuela’s future is key to the future of the American continent. “The destiny of Latin America is at play in Venezuela, just as it was 210, 215 years ago,” Garcia Linera said. The Bolivian leader, academic and former leftist guerrilla said the destiny of progressive movements in Latin America could be defined by what happens in the coming days. Garcia Linera and Bolivian President Evo Morales have been consistent and outspoken voices supporting Venezuela’s sovereignty, and calling for non-intervention in the affairs of the South American country.